If movies are anything to go on, it would seem there are several ways to build your own dinosaur. We could generate one with the help of some amber, a mosquito, and extracted DNA - but those of us without a high-tech laboratory on a top secret island generally miss out on the fun. Until now, that is. The Remote Control T-Rex is a customizable, 3D puzzle that not only has a working remote control, but a motion sensor to bring your prehistoric dreams to life. Paint it your favorite color and watch it roar, snap and chase after little prey to your heart's delight. Like a remote-control car, but so much cooler (and with zero percent chance of a hostile, dino takeover.) Assembled in Ohio of sustainable basswood from Russia and parts from China. Assembly required, but no glue needed! Requires three AA (T-Rex) and two AAA (remote) batteries, not included. Ages 8 and up. Not suitable for children under 8 years of age, due to small parts. I bought this for my 11 year old daughter for Christmas. It took her a few hours and a few tries to get the puzzle together and the dinosaur to behave as advertised. Great opportunity to develop problem solving skills! This guy is a hoot. His whole body shakes when he roars, and ours does not have any volume issues. The only downside is he can't walk on carpet, so that limits the areas she can play with him in our apartment. She has played with him every day since Christmas and said this was her favorite gift this year. On certain movements initiated via the remote control, the T-Rex pitches forward and lands on its head. The poor thing is front heavy. The "roars" are mere whispers. It is a little interesting to see it undulate a little bit as it goes through its movements, but it's something you'll watch once and then put away. Got a "thumbs up" from my 12y/o grandson. Said "it was fun & not too easy to put together." Fun gift, even for adults! This was a 5 year anniversary gift (wood) and was a hit. SORRY, can't give a review...had it sent to my son for his bday. haven't received any word yet. My girls got this for daddy for Christmas - and they had so much fun putting it together! The 5-year-old could help locate pieces. Fun fun project for all and the dinosaur is super cute! This dinosaur is really cool. My son has a great time operating the remote and making it growl (it growls in response to you growling!). However, I wonder if our wood was defective because our T-Rex had trouble balancing from the beginning. Often it would topple over while standing still upright. In one of its falls from standing, the right "hip joint" snapped and the right leg separated from the body. Fortunately my son is still having fun with the one-legged dinosaur, but we were pretty bummed to see it fall apart so easily (it lost the leg on its third day of "life"). Bought this for a teen and a twenty something. They both thought it was a hoot. my nephew exclaimed it was his favorite gift for his 9th birthday. he loved that it required him to build it before he could play with it as a remote control toy as he seemed to understand he would appreciate it that much more. a big hit for his birthday.... would definitely recommend! 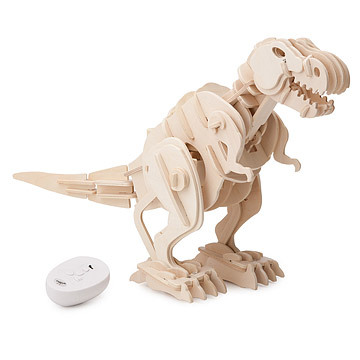 The Remote Control T-Rex is a customizable, 3D puzzle that not only has a working remote control, but a motion sensor to bring your prehistoric dreams to life.